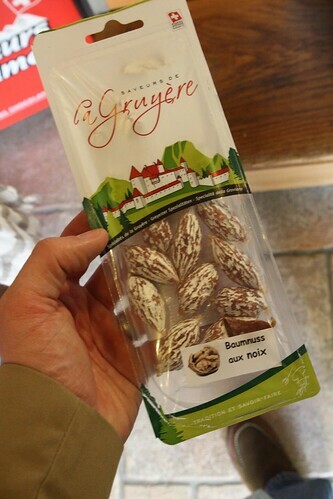 Today we started off the day with one goal: have some Gruyère cheese in Gruyère. Normally this would be unachievable but being that we were closer to Gruyère than we've ever been in our lives it was quite doable. 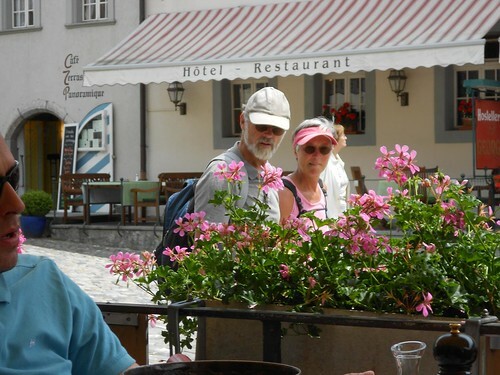 During lunch the smell of fondue hung heavy in the air. That sentence sounds like something that someone who has never been to Switzerland would say to try to make it sound like they were in Switzerland. However, it was very true. 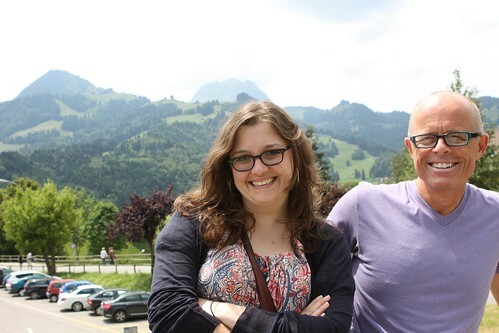 The nice part about today is that we were in the French-speaking portion of Switzerland which meant we were able to actually understand the menus at the restaurant and not receive anything with garbage in it. We even saw a guy that looked almost exactly like my dad (particularly from far away). When he passed I grabbed Jen's camera and took a quick candid shot of him. I wanted to see if he's pose for a picture with me but I felt that he might not speak English and may call the Swiss police. The French Swiss are very helpful. 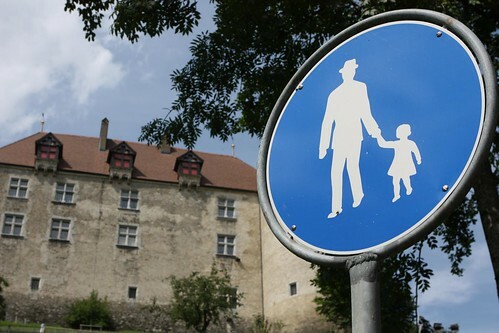 They even have signs up to direct men in fedoras in which direction they should travel by foot after they have stolen small children. 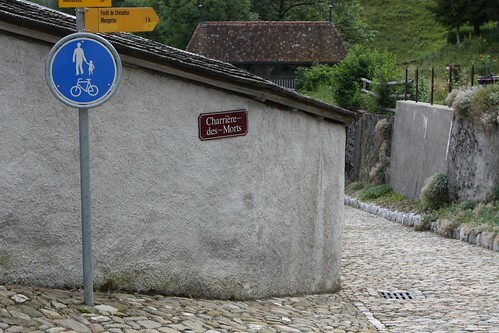 They even have different signage if the child thief has made the decision to make his escape by bicycle. 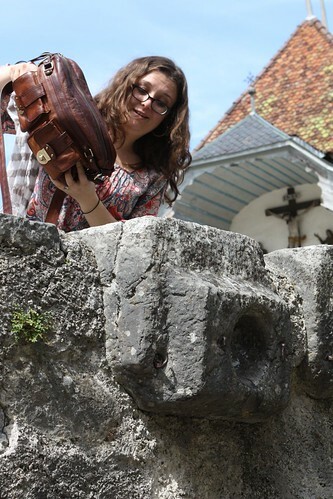 Here Jen demonstrates how the ancients of Gruyère would measure their grains for their customers in these special stone spouts located in the town square. I always like to purchase whatever the oddest foodstuff I can find is. Today's winner are these little salamis that are stuffed with whole walnuts. We purchased this from an extremely uptight French woman who yelled at me for touching a brioche, yelled at Jen for accidentally touching a sausage, and yelled at Gregg and Ross for asking a question about a cheese. She also got annoyed with me trying to pay by credit card and took the liberty to peek into my wallet and ask that I pay by the Swiss Francs I was hiding. I've been on vacation for four days and I have been yelled at four times. In my humble opinion I have not deserved any of these reprimands. I think tomorrow I'm going to mix it up with someone in town just so that the scolding is justified. We stopped at a beautiful scenic overlook where Gregg spent most of his time doing his impression of Shirley Temple in Heidi saying, "The grandfather, the grandfather!" This might have been the best part of the trip so far. 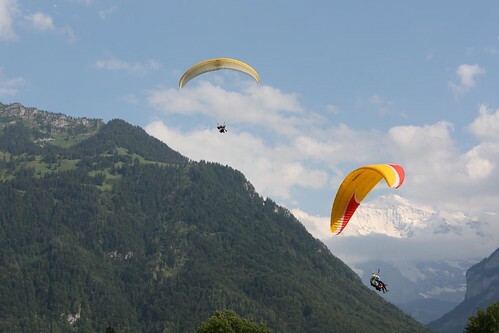 We then got in the car and drove to Interlaken where the sky was full of hang gliding tourists. We also got brochures from about seven different companies that offer hang gliding services. 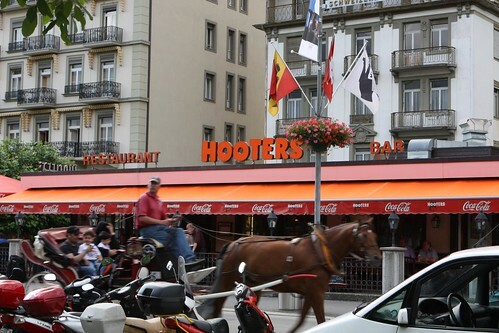 There, perched amongst the rolling hills of the Alps, was a fantastic restaurant called Hooters. Hang gliding, horses roaming the street, Hooters. It was a pretty amazing town. We got home around 8:00 PM and had a lovely dinner of leftover snacks and this beer that I picked up in Interlaken -- another Swiss lager. Many of my food-related goals for the trip have been met. I've had Swiss wine, Swiss beer, veal sausages, veal in cream sauce, and Gruyère. I even accomplished goals I didn't know I had like getting walnuts encased in tiny salamis. 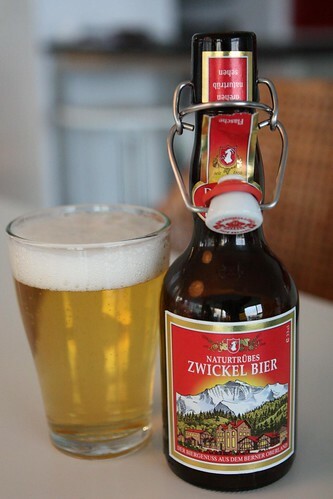 With one day left in this country I have one goal left: to have a Swiss beer that is not a lager. Is this enough time? Will I meet this goal? Can it be done? Who will yell at me tomorrow? Well, you'll have to tune back tomorrow to see how I do in my latest idiotic goal.